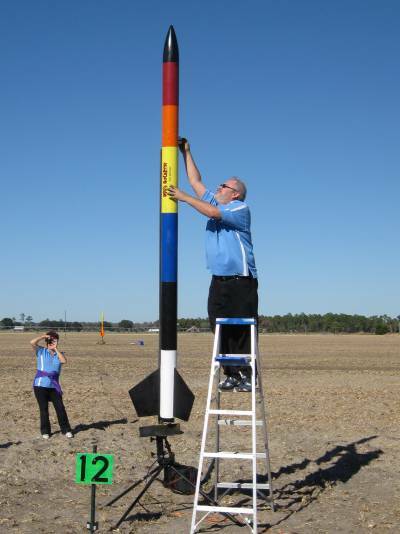 Welcome to OrlandoRocketry.com, a resource for those interested in model rockets and high-power rocketry in Central Florida. 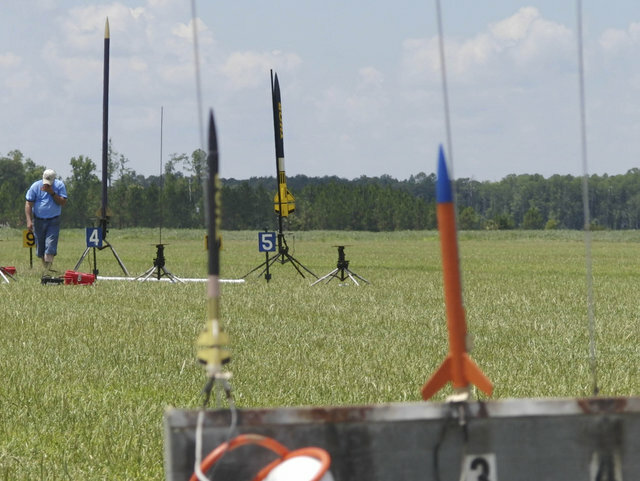 In addition to the brief Introduction to Rocketry below, this site includes information on local rocketry clubs, other web sites with additional information about rocketry, places to shop locally and online for rocketry-related products, and recent Central Florida rocketry news. Hobby (or sport) rocketry is the exciting, safe, and education activity of building and flying rockets. The hobby is divided into two main divisions, Model Rocketry and High-Power Rocketry. 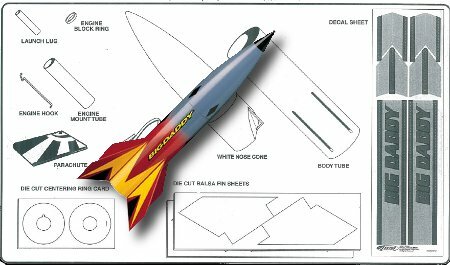 Model rockets are constructed of light-weight materials such as cardboard, plastic, and balsa wood. Model rockets are launched using small, commercially-made rocket motors (sometimes called engines). Although each motor can only be used once, the rockets are reusuable. They usually return to earth under a parachute or streamer and can be flown again by replacing the used motor with a new one. A model rocket motor is ignited with an electrical system called a “launch controller.” Pressing the launch button on the controller sends an electric current to an igniter installed in the rocket motor. The igniter heats up, igniting the rocket motor’s propellant and sendng the rocket skyward. Using a launch controller allows you to precisely control when the rocket launches, remain a safe distance from the rocket at launch, and be far enough away that you are able to watch the rocket in flight. Most model rocket motors include a delay and ejection charge. The delay allows the rocket to coast for a few seconds after the motor’s propellant has been exhausted. Then the ejection charge fires out of the top of the motor to cause the rocket’s parachute or streamer to deploy so that the rocket is returned to earth safely and without damage. There are two good ways to begin. One way to get started is to purchase a model rocket launch or starter set from a local store or online. An example is the Estes Tandem-X Launch Set pictured below. Like most launch sets, it includes a launch pad, launch controller, and a rocket. 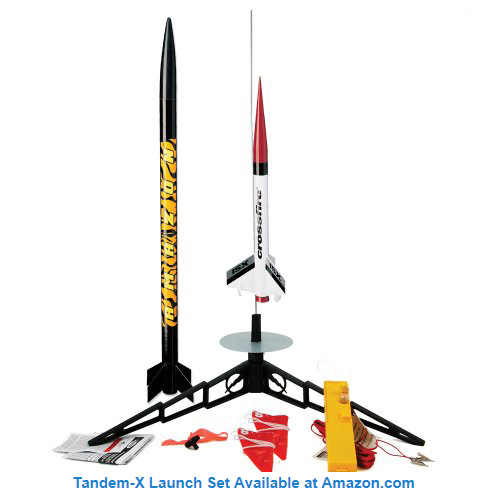 The Tandem-X set actually includes two simple-to-build rockets. To build the rockets you’ll need some tools and supplies such as white glue, plastic cement, a ruler, a pencil, sandpaper, and a craft knife (such as an Xacto knife). The motors you need to launch the rockets are not included, but you can also purchase them locally or order them from Amazon.com. You will need B4-2 motors for the larger “Amazon” rocket and A8-3 motors for the smaller “Crossfire” rocket. You’ll also need a package of recovery wadding, which is used to protect the parachute from the hot particles in the motor’s ejection charge, and four AA batteries to power the launch controller. After you’ve built the rockets you’ll need to find an open place where you can safely and legally launch the rockets. Carefully follow the directions including with the launch set as you prepare and launch the rockets. The second way to get started is to build a rocket kit, purchase motors and recovery wadding for it, then bring them with you to a local rocketry club launch. You can start with a launch or starter set, but most clubs have launch pads, so you buy and build a simple kit as your first rocket. For your first rocket, you’ll want something easy to build. Look for a kit labeled “Ready-To-Fly” or “Almost Ready to Fly” if you are more interested in quickly having a rocket ready to fly than building one. Look for a kit labeled Skill Level 1 if you would like to gain some experience building a model rocket kit. Flying your rocket at a club launch has several advantages. You don’t have to worry about finding a large open area and getting permission to use it. You get to meet others who build and fly rockets. You can ask questions that others will be happy to answer. And, you get to watch the launch of many more rockets. High-power rockets are larger, more powerful rockets which are often constructed using stronger materials such as fiberglass and plywood. These are the large rockets you may have seen on TV shows on the Discovery Channel and other cable networks. The TV shows often portray the flyers of these “large and dangerous rocket ships” as being wild and crazy. The reality is, however, that high-power rocketry has an outstanding record of safety because everyone involved is committed to following the rules to keep the hobby safe and legal. To fly high-power rockets, you must be a member of a national organization – the National Association of Rocketry or the Tripoli Rocketry Association – and be certified to fly high-power rockets. 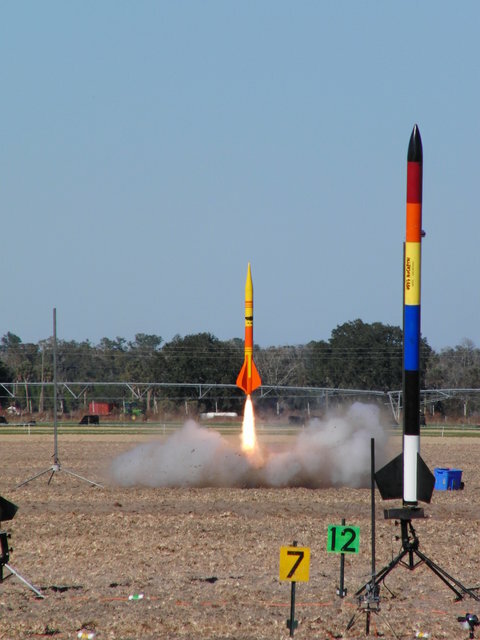 Most rocketeers flying high-power rockets use commercially-made motors. These motors, however, are usually reusable with just the propellant being replaced between flights. Many high-power rockets use electronic altimeters to deploy the rocket’s parachute. Since these rockets may fly to altitudes of several thousand feet, most use a recovery method called “dual deployment.” At apogee, the highest point in the rocket’s flight, the altimeter fires an ejection charge to deploy a small parachute called a drogue. The rocket falls quickly until the altimeter has determined that it has reached a specific altitude such as 700 feet. At that time, the altimeter sets off a second ejection charge to deploy a larger parachute which slowly lowers the rocket to the ground. 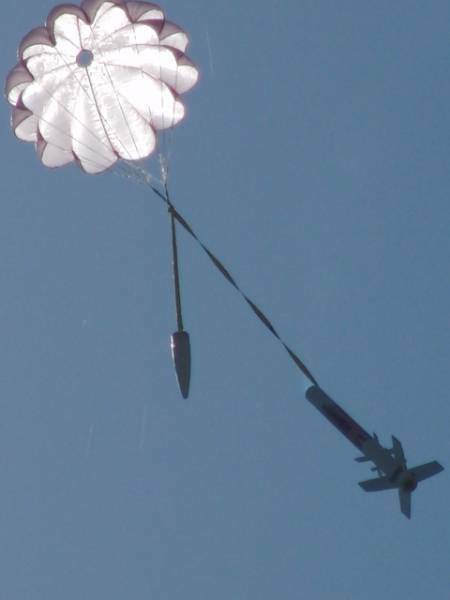 Because the rocket falls faster under the smaller drogue parachute, it drifts less, reducing the distance the rocketeer has to travel to recover the rocket. Special permission from the FAA is required to launch high-power rockets. Rocketry clubs hosting high-power launches obtain a “waiver” from the FAA allowing their members to launch high-power rockets at club events. There are several rocketry clubs in Central Florida which support the flying of high-power rockets. Ive been bitten by the bug. I fly r/c airplanes and helis. Recently I have been building PVC sugar motors and trying to analyze all of the variables to refine my motors. But, I seem to have reached a plateau. I’m interested in learning more about your organization. PVC motors are not safe and cannot be flown at our club rocket launches. The Tripoli Rocketry Association has an research rocketry program which allows certified fliers to fly rockets with homemade motors. The Research Safety Code specific forbids the use of “frangible” materials (such as PVC) as motor casings. I encourage you to visit Jimmy Yawn’s web site at http://www.jamesyawn.net/ and email Jimmy if you have any more questions. Also try to attend a local high-power rocket launch to meet people who can help you learn how to safely and legally make your own rocket motors. I have two girls that would be interested in watching a rocket launch. Any local launches close by to Mount Dora, Fl? The ROCK and NEFAR launch sites are the nearest to you (see Rocketry Clubs Near Mt. Dora, Florida). They are each about an hour’s drive away, but you might want to try making the trip to one of their launches. Both clubs have nice launch sites. The ROCK launches are probably better suited for children since it’s a launch limited to smaller, model rockets. I haven’t launched rockets in over 23 years and it was nice to see that some of my rockets have held up in the storage. I also have rocket motors that appear to be in good shape too. My question, are the engines still good, or would you have to do a visual inspection? I’ve used model rocket motors that were more than twenty years old. You will probably need to replace the igniters, but, otherwise older motors usually work fine. A lot depends on how they were stored. If they were dropped, crushed, or subjected to dramatic changes in temperature, for example, the propellant can separate from the engine’s cardboard casing. This can make it overpressurize and fail when you use it. You can’t see this problem, though. So, if the motors appear in good shape, I’d suggest going ahead and using them. But, try them in a rocket that you don’t care as much for first. 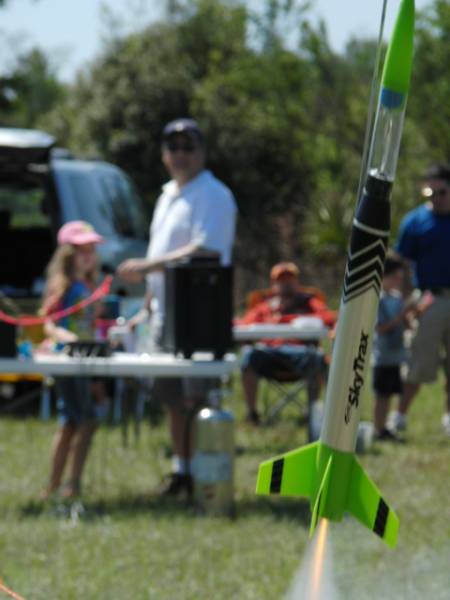 Great to see there is so much rocketry activity in Central Florida! As a student in the 1980’s, I spend a summer in the Orlando area and when flying back to Europe, my baggage was full of rocketry kits 🙂 And I´m still in model rocketry running a website called “European Model Rocketry” at http://www.europerocketry.com (feel free to visit it). I just moved to Florida and am ready to get my kids into recketry. Does anyone know a good place in Sanford to launch? Thanks! Please come to one of the ROCK launches in Oviedo on the first Saturday of the month. I’m sure you’ll find someone at the launch who lives near Sanford and may be able to help! I think you’ll also enjoy the club’s launch.